Deploy a complete suite of engagement and monetisation tools to your online content, with minimal engineering. Leverage your content's appeal with engagement, subscription and monetisation models tailored to specific user segments — all on one platform. Provide low-friction registration and sign-in processes that create rich user profiles through incremental data capture, social enrichment and behavioural monitoring. Create a single customer view - across brands, domains, channels and devices - to effectively engage with your audience wherever they are and however they consume your content. Centralise and secure user data, with your choice of encryption standard, to ensure privacy, compliance and confidence at all times. Deploy branded sign-up and sign-on modules to your site with only minor changes to code. Streamline registration for your users, and enrich their profiles, with social sign-on supporting popular platforms. Unify your users' identity and experience across brands and devices with secure, single sign-on technology. The Evolok digital subscription platform supports the full spectrum of content gating models, from freemium all the way through to hard wall. Pick your gating strategy, or strategies, deploy them seamlessly to your site, and trigger them on practically any data point or behaviour. Craft constructive gating policies that promote membership and reward conversion and enhance the experience for subscribed users. No matter your content access strategy, Evolok supports it with metering, dynamic paywall, hard-wall and more. Use a massive range of data points to trigger and target content gating; including time, location, content type, device and more. Detailed reporting and analytics reveal the impact of each strategy, enabling continuous testing and optimisation. Capture information about every visitor, identify attractive segments and personalise every touch point - from advertising to registration and beyond - to optimise the user experience, increase engagement and stickiness, and drive subscriptions. Create and prioritise segments, in real time, based on anonymous user behaviour and content interests. Target attractive segments with bespoke, rule-based content personalisation and registration offers. Align advertising and subscription packages to specific segments to maximise the value of every user. Transform your digital subscriptions into a rich revenue stream with a range of monetisation tools and technologies. The Evolok digital subscription platform takes care of product creation and management, payments and customer services, all from the one interface. Leaving you to focus on creating great content. Define multiple subscription products and allow users to select the level and cost that suits them, or reserve specific product for specific segments. Accept payments via credit card or integration with a range of popular payment gateways i.e. Stripe. Detect adblock users and incognito browsers and challenge users to permit ad personalisation or subscribe to your content. 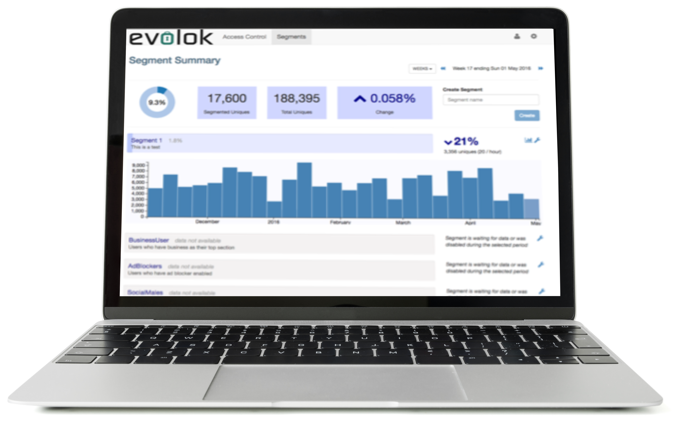 Find out how Evolok solves your subscription and monetisation challenges.